I love the cooking part but I really dislike the clean up! This is what my kitchen looked like a little bit ago. It was a mess and I still have lots to do over the next few days. 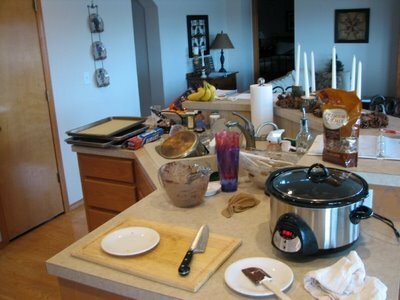 I did get my kitchen cleaned up, at least for now. I have most of my candy made and tomorrow I will make the rest of the desserts. I also got all of the presents wrapped. We invite all my our staff and their families to this office party. It is kid friendly and we enjoy having the whole families here. One of the ways we include everyone is to make sure everyone goes home with a gift. We try to make them nice gifts. We play the White Elephant Game except we are providing all the gifts. It is way to have some fun that includes everyone at the party. We try to get gifts that at least someone in the family will enjoy. I will not tell what the gifts are this year, but some of the past gifts have been: gift cards, cash, cookbooks, candles, throw blankets, mag light flashlights, kitchen items, body lotions, and more. 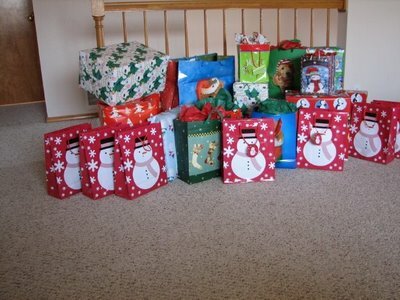 I am glad that I finally go all this year’s gifts wrapped. I really do not enjoy wrapping gifts. I don’t know why, I just don’t. I would much rather be in the kitchen making something good to eat. What is the White Elephant Game? Is it like a Yankee Swap?? What is Yankee Swap? I am not sure but they may be the same. In white elephant you each draw a number. When your number comes up you can either steal a gift from someone that has opened one or you can pick an unwrapped one. You proceed until everyone has a gift. Are they the same?